Community Builders is a ministry whose vision is to be a witness to the love of Jesus Christ in our community. Its mission is to serve our un-churched friends and neighbors by helping them with light construction and maintenance projects around their homes. Our presence with them offers the opportunity to explain our love for them in the context of God’s love to us that He showers on us through the Gospel message. Refer a project to Community Builders. Do you know someone in your neighborhood who needs help? Let us know and well meet with them to see if we can help them. 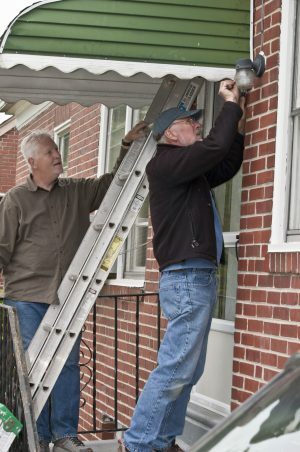 Community Builders Projects involve a wide range of activities that can use most every person’s skills, whether it is cleaning, organizing, raking leaves, painting, to pounding nails to install a new roof. There is a job just for you. Those who help are amazed at how “many hands make light work” and those helped are filled with joy as they are relieved of burdensome projects. Prayer is an essential part of this ministry. Our goal is to serve Jesus Christ as we serve others. But the Spirit must go before us to prepare the hearts of those helped if Jesus Christ is to be served. We welcome you to join us in praying for this ministry as we seek to engage our community and serve as Jesus’ ambassadors.